What is at stake in philosophical debates on values is whether it is possible to accurately describe our moral, aesthetic, religious or otherwise evaluative experiences without entering an ontological commitment to values as independently existing objects that cannot be reduced to physical objects. As far as values emerge in Felix Kaufmann’s work this venerable debate is reduced to the question of how social scientists should deal with the fact/value dichotomy. 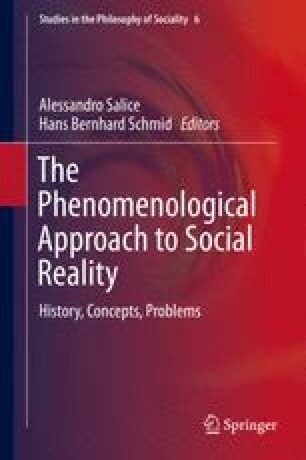 The present essay aims at elaborating and challenging Kaufmann’s thoughts on values and their impact on his understanding of social reality. In order to approach this aim I introduce two methodological issues, called strata of experience and the philosopher’s fallacy, which offer a suitable framework for inquiring into Kaufmann’s Methodenlehre (1936), his Methodology (1944) and other relevant materials. In accordance with his positivist leanings, Kaufmann maintains that any legitimate concern for values must restrict itself to analyzing value judgments as part of a scientific methodology. Contrary to this, I argue that subverting and bypassing descriptions of everyday evaluative (e.g. moral) experiences, including fine-grained analyses of their intentional structure, represents a serious deficiency of Kaufmann’s approach. The latter is brought to light by presenting Husserl’s phenomenological investigation of evaluative experiences which neither complies with the narrow range of a purely scientific treatment nor embarks on the opposite extreme of value Platonism. It is this rigid opposition that lurks behind Kaufmann’s relegation of values into the sphere of irrationality. Having contrasted Kaufmann’s and Husserl’s value inquiries, I conclude by taking stock of their implications. In doing so, I, first, try to figure out their overall understanding of social reality. Secondly, I ponder their presumable responses to current debates on entangling or disentangling views with regard to the fact/value dichotomy.